Refer to the product tag for a complete list of ingredients. Take out 2/3 of feed ration per feeding three days prior to the show and add 1/3 parts Stretch. 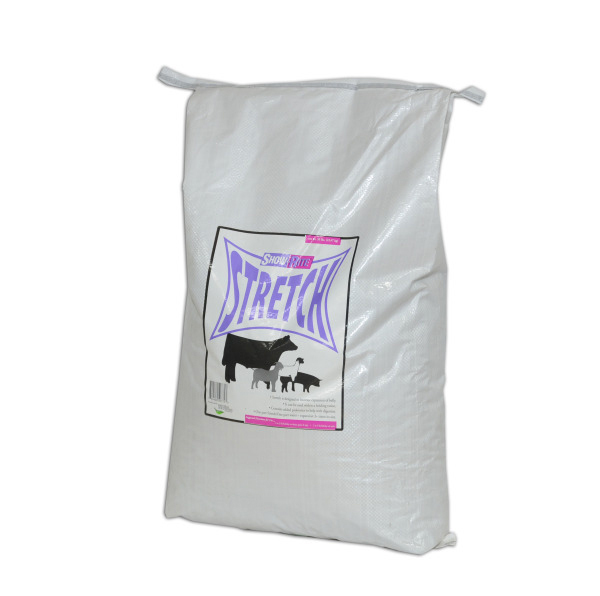 Increase the amount of Stretch for your desired show day fill. By doing this, you can control their feed intake and you will be able to fill your animal as much or as little as you wish. Allows supply a source of fresh, clean water. Top Dress or mix product at the rates below into grain ration of animals being fitted for exhibition. Allows supply a source of fresh, clean water. Muscle-In-Motion is a carefully formulated top-dress pellet designed for optimal muscle expression, fleshiness while maintaining soundness, and flexibility in show animals without the effects of paylean or other drugs. Designed for all classes of growing/finishing swine, sheep, goat, and beef cattle. Muscle-In-Motion has added high levels of Lysine and other Amino Acids, high levels of Fat, and high levels of Fishmeal. Swine: Top-dress 1 to 2 lbs. of with 3 to 6 lbs. of a complete swine feed. Feed to achieve desired body composition and muscle mass to show pigs that weigh from 120 lbs. to show desired show weight. Sheep and Goats: Top-dress 6 oz. per day with a complete sheep or goat ration. Beef Cattle: For growing/finishing cattle, top-dress at the rate of 1 to 2 lbs. per feeding with a complete cattle ration.